Now, I must say, as a quick disclaimer, that in no way am I the next Jamie Oliver, Gordon Ramsay or Wolfgang Puck. HOWEVER, I've learnt that in NYC - "Quick & Easy" is the way forward when it comes to food. Someone once told me that "you could eat out every night for the next 54 years in NYC and never eat at the same restaurant twice", and heck, I believe it! The food here is insane and within a week I was signed up on "Seamless" (America's "Just Eat" equivalent). I could have easily fallen down a pathway of American Candy and snacks however I've slowly begun opting for healthier options to keep me going. Todays "Quick & Easy" is my Avocado Toast Brunch. A meal that was made for me, for a late breakfast by my friend Jess. Now since consuming this delicious meal the first time, I have made it a near 20 times myself in the past 8 month and I do not get bored of it. The way I'm going to show you how to prepare is in its simplest form, this enables you to adapt the recipe so that you can add anything you like into the mix. Jess adds a spicy kick. I like mine with extra cherry tomatoes. Experiment with different spices and seasoning and be sure to let me know how it turns out. 1. Cut and dice your avocado. I clearly led a closeted avocado life at home as I DID NOT know how to do this prior to moving here. You cut the avocado in half, hit the knife into the stone, twist and remove the stone. (You can keep it to put in your mashed avocado spread later to keep it fresh). Slice the inside of each half of the avocado and squeeze the insides out of the skin into a bowl. 2. Quarter-cut a handful of grape tomatoes and add them to the avocado. 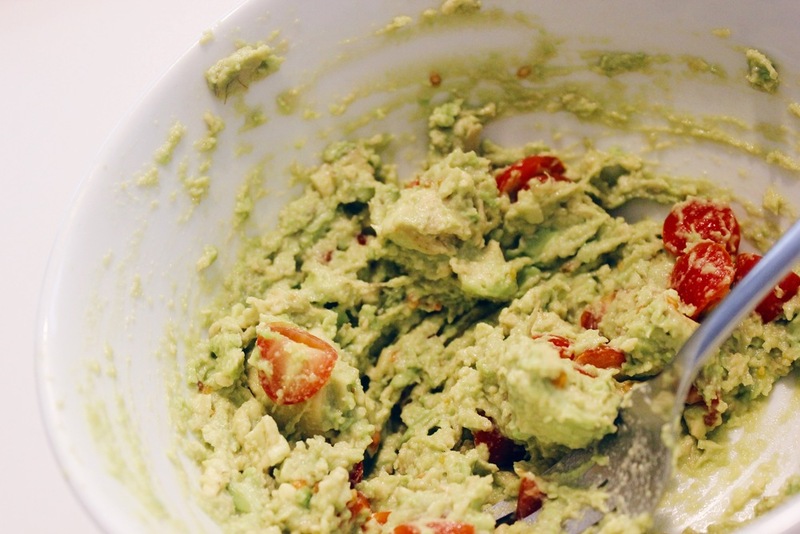 At this point you can add onions, peppers, nuts or anything you want to add to the avocado spread. I normally add a little bit of lime at this point to keep the avocado green and fresh whilst also adding a little citrus kick to the spread. 3. Grab a fork and mash the avocado and grape tomatoes together. At this point I usually add the pepper and try to get a baby food consistency. Gross I know, but stick with me it is WORTH IT. 4. Spread the avocado mix on the toast. You can stop at this point because heck this tastes so damn good on its own, particularly as a vegan option. But I love to add egg's over-easy on the top. Why? BECAUSE IT TASTES EVEN BETTER. 5. Spray up that pan and cook the two eggs to any way you prefer, scrambled, sunny-side-up etc. Recently I've been cooking in coconut oil or spray which I've found makes a different to the taste of the eggs. I added pepper, salt and all-spice to the eggs as they were cooking but again this is up to your likes and dislikes. 6. Add the eggs to the top of your avocado toast. I mean it really could not be simpler! I could totally be overcompensating for how much I love this meal but roll with it guys, shake it up and make it your own. It is perfect for breakfast, brunch, lunch or dinner. Anytime of day and takes no more than 5 minutes to sort out. Let me know how yours turns out and any ways you adapt the recipe!! I'm working on a number "Quick & Easy" recipes to add to this category of NevNYC. **WEBSITE UPDATE** - You are now able to comment, like and share the blog posts! Check back on Wednesdays and Sundays at 12PM for the latest NevNYC post. If you enjoyed this post be sure to like it at the bottom of the blog! !